"I'm trying to use handbrake to copy some DVD discs that I've got. Everything runs normally, but when I open the completed files, the audio is a second or more after the corresponding part of the video. I've searched for things like 'audio sync' and 'lip sync', but I haven't found anything that helps." The best HandBrake alternative WinX HD Video Converter Deluxe is able to convert/encode videos among all popular formats while keeping the video match with audio perfectly. Why HandBrake Output Video/Audio out of Sync? How to Solve It? Sometimes Windows Media Player acts funny and so does QuickTime when it's choking. Even VLC will hiccup and sometimes go out of sync. You have to understand, H.264 is a CPU intensive codec even in playback. So, try another powerful player like 5KPlayer to see if the audio is still out of the sync with the video from Handbrake. A system reboot is necessary. When processing video editing, encoding, or downloading, the system goes all wacky. This has an effect on playback programs, sometimes making the video go out of sync with the audio. Maybe you're encoding with intense features. High refs, b-pyramids, 8x8 and even CABAC, can slow down the video behind the audio. Thus, a slower machine is likely to encounter audio out of sync issue. Are you using Xvid? Then yes, you may have problems then. Older ASP codecs like DivX and Xvid and the ancient .avi container they use are notorious with A/V sync issues when encoding from MPEG-2 content. Framerate need to be adjusted. Solution 1. Make sure to use "Constant Framerate". 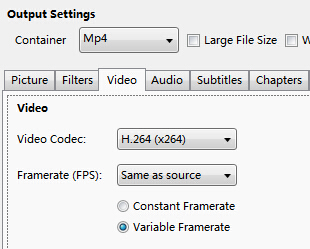 By default, "Variable Framerate" is checked when you use HandBrake to encode videos or rip DVDs. But that may cause issues with sync, especially when demuxing the file. So specify "Constant Framerate" following Output Settings -> Video -> Framerate(FPS), preview it and see if the video matches the audio. Open HandBrake -> load the file with video audio out of sync problem by clicking "Source" and then "Open File" -> press "Video" tab under Output Settings, and then specify a proper framerate from the drop-down list. And then click "Preview" on the navigation bar, and check if the audio out of sync problem has been fixed. If not, try another framerate. Solution 3. Try HandBrake alternative if all the solutions are not workable. HandBrake video audio desynchrony problem is possible to be fixed by resetting framerate. However, some users point out that HandBrake output video plays fine on PC, but after being transferred to Android, iPhone or other device, A/V doesn't match up properly again. If this is the case, you can find a HandBrake alternative to solve Handbrake output video/audio out of sync issue. WinX HD Video Converter Deluxe is a professional yet easy- to-use video converter, specially designed to convert all popular file types to the format/device you desire. You can convert videos to MP4, MKV, AVI, WMV, MOV, FLV, 3GP, iPhone, iPad, Apple TV, Android Samsung, HTC, Google, Amazon, Sony, Microsoft, etc. without audio out of sync with the video issue. No need to set framerate or do other settings. Everything has been optimized. The output video can be smoothly played on any device. WinX DVD Ripper Platinum is a popular fast DVD ripper. Superior to HandBrake, it can rip both regular and protected DVDs. Meanwhile, there's no need to set video audio parameters to make video match audio. You just need to input a DVD, and then directly convert videos to 320+ output formats/350+ preset profiles. You can rip DVD to MP4, MKV (Mac version only), AVI, WMV, MOV, M4V, FLV, etc. without video audio sync problem happening to HandBrake. "this page surprising me! i used to tought it is the trouble caused by my handbrake, since it is likely to use handbrake but the output audio is out of sync with video. now i got know the right way i should go is get proper video encoder, media player as well as decent video sources. thanks a bunch for your thoughtful info, by the way i ll surely give your software a try." "somewhat handbrake may also cause video/audio sync issue... when i try to rip other region dvds, the framerate need to adjust to 25 for pal dvd and 29.7 for ntsc."